Double his six-figure corporate income within 1½ years of leaving the grind. Double his net worth within two years of leaving the grind. Earn 60% of his income from passive and scalable sources. Build a nearly 1-million dollar real estate portfolio. … all while being in charge of his own time and priorities. Justin spent over a decade refining the principles in Leave the Grind Behind, reading hundreds of books and working with some of the best professional and personal coaches in the world. He has been featured in Lifehack, Big Time Startups, InvestFourMore, Nice Guys on Business, Leadership Master Academy, inPulse, The Huffington Post, and much more. Justin maintains a personal life rich in family, spirit, happiness, health, and community. Listen to samples of Justin's motivational style. What inspired you to want to write this book? What makes your path to freedom from a standard job and into a life someone designs for themselves different from any others that are out there? What does it mean to be a Cog or a Grinder? How did you know you wanted to stop being a Cog? How can a shift in attitude lead someone on the path to being a Grinder? What are the five steps to setting Grind-worthy goals? Why are these goals important? Who will benefit most from following your advice? What sets your book apart from all other motivational and financial growth books on the market today? "Gesso provides the roadmap that will give your listeners the confidence to leave the grind behind and start a life in which they drive the results; one where they earn money via multiple channels, are in control of their time, do things they enjoy, and leave a legacy that makes them proud." 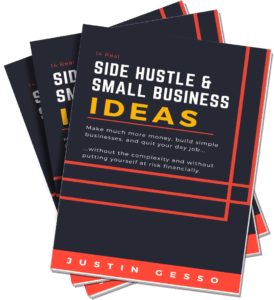 "Leave the Grind Behind dives deep into the tactical steps and actions you need to start taking today to find yourself making money on your own quickly. Having left my corporate job to run a successful business of my own, I will tell you...take this model and execute on it." "Move over Tim Ferriss, there's a refreshed approach to unshackling yourself from the grueling busy-work of the grind. Having taken many steps to minimize the impact of wasted time, I came ready to hear what your approach would be. I found the basis in mental energy to be right on target--the minute anyone puts themselves in a position to want change, the first challenge is always overcoming their own psychological barriers. Affirmations tied to habits tied to goals...you've covered critical ground to make positive change. Once I made it through, I found myself itching to do the actions. I couldn't wait to hit the street!"